There are differing opinions as to what was the first mystery novel. It all started in the mid-1880s, and even then there was already a branching in the genre. There were earlier short stories, but the first work of detective fiction is considered by most to be Poe’s The Murders in the Rue Morgue, published in 1841. Some think the first mystery novel is The Woman in White by Wilkie Collins. Others disagree because it is much more than a mystery novel. Dickens wove mystery into Bleak House in 1853, and the Mystery of Edwin Drood (1870) is probably the ultimate unsolved mystery as Dickens died before finishing it. And then Arthur Conan Doyle introduced Sherlock Holmes in 1887, and the popularity of the genre increased greatly. So, there are several authors who stood at the beginning of the genre, but who was the first? Several history sleuths give that honor to Charles Felix who wrote the Notting Hill Mystery which appeared in a weekly magazine in 1862 and in book form in 1865. His story was about a man who took out several insurance policies on his wife and then proceeded to poison her. It was also the first example of a mystery writer using a pseudonym. The 1868 Handbook of Fictitious Names lists Charles Felix. But next to his name is an empty bracket. So that introduced another mystery… who was Charles Felix? That mystery has been solved by several, including Paul Collins who told the interesting story in an NPR interview with Weekend Edition in 2011 (https://n.pr/2M1cqYw). The real author was Charles Warren Adams. Interestingly, illustrations in the magazine were done by George Du Maurier, the grandfather of Daphne Du Maurier who wrote several novels, including Rebecca and My Cousin Rachel. These authors laid the groundwork for detective and mystery fiction. Their stories introduced something new… stories laced with clues, red herrings, a detective who solved a mystery using deduction, and, of course… murder. 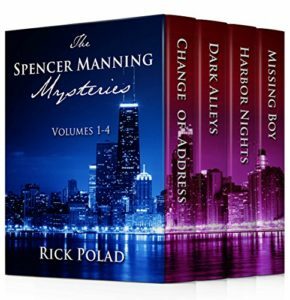 But the authors who influenced me most when I created Spencer Manning, and whose books my father loved to read, were yet to make their appearance.